Our vision is to develop well-formed Catholic youth, renewed in mind, heart and spirit. Our goal is to create well informed functioning teens who are on fire for Christ. 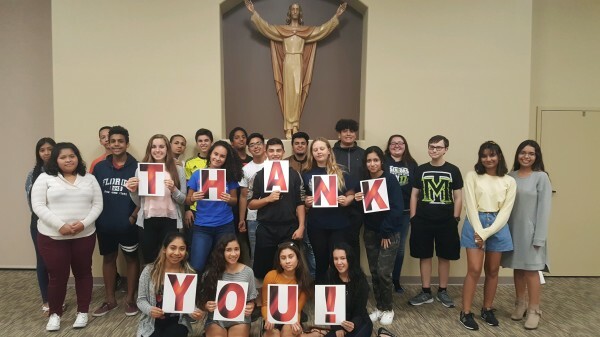 The Purpose of the Saint Augustine Youth Ministry is to create environments that enhance opportunities for our youth to find a safe place to be themselves, express faith and emotions, experience God, and embrace community. We strive to support parents as the primary catechist and we value the active support and involvement of the community as we aim to implement this vision. We invite all High School Youth to participate in the weekly meetings Wednesday Nights in the Parish Life Center. All Middle School students are welcome to join us once a month in the Parish Life Center. It is a requirement that all candidates for Confirmation attend weekly youth meetings. Confirmation is typically received in 9th grade. For Confirmation information, please click here . Are you a high school teen looking to share your faith with your peers? If so, complete the application to be a part of the Peer Leadership Team. If you are a recent graduate and would like to return as one of our leaders, plese complete the Junior Core Application . If you are looking to participate as an adult volunteer, please take a look at the Adult Core Team application. For information, please contact Iliani Perez, Youth Ministry Leader at the Parish Office 407-695-3262 or email: youth@saintaugustinecc.org . may know they are valued and valuable beings. gifts of young people, in the ministry opportunities we offer to them, in the journey of faith we walk with them, in our shared mission as a community called to discipleship in the world.